The Pico Model C is like a Keurig coffee maker for home brewing—but what exactly do you give up? The Pico Model C makes beer brewing incredibly easy, controlling temperatures and timings, and using pre-filled ingredient packs. 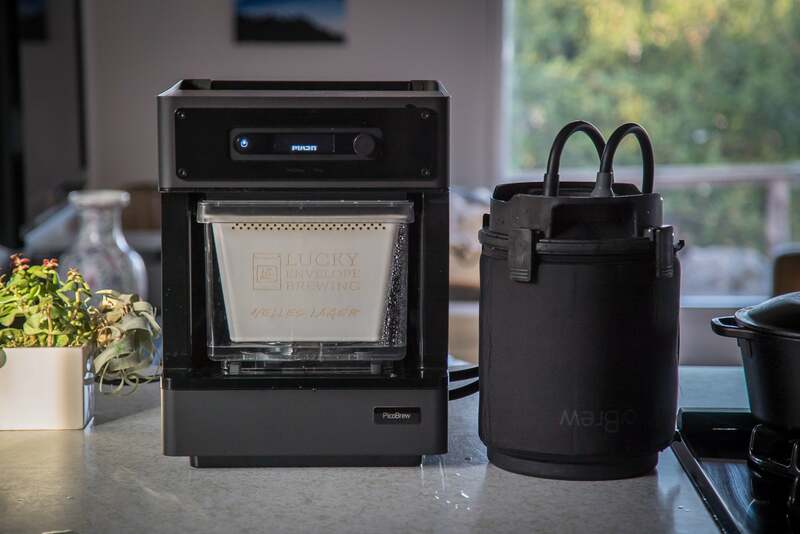 It's like a Keurig coffee maker for home brewing—but what exactly do you give up? If I told you I brewed five liters of perfectly drinkable craft beer, and it took under an hour of my time including cleanup, you probably wouldn’t believe me. 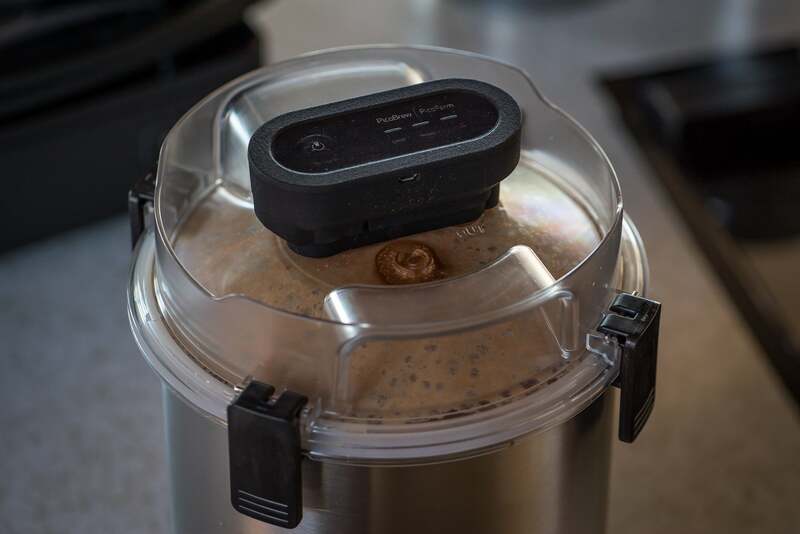 Nonetheless, PicoBrew’s newest appliance, the Pico Model C, helped me do just that, turning the home-brewing process into a practically set-it-and-forget-it affair. Sure, the beer still required more than two weeks for fermentation and carbonation—you just can’t speed up these phases of at-home brewing. But thanks to an evolution of PicoBrew’s equipment, beer making has never been so easy. Or quick. The Model C simplifies beer making in multiple ways—from heating water, to mashing, to boiling, to fermenting. It also takes all the pain out of transferring your brew from a boiling pot to a fermenting keg, and once again to a finishing keg. PicoBrew’s first beer-making appliance, the Zymatic, required you to put loose grain and hops in specific compartments for the boil, but the Model C uses proprietary PicoPaks, which are sealed containers with grain and hops inside. 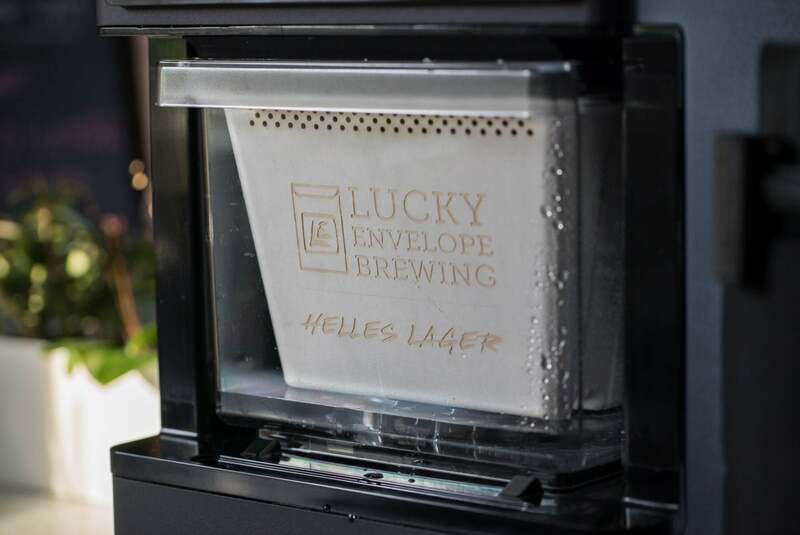 You can think of them as giant Keurig pods (except for brewing beer), and the PicoPaks are even based on recipes from commercial craft breweries. Each PicoPak comes with a big bin for grains and a small bin for hops. The brewing process takes just a few hours, and besides pushing a few buttons, operation is completely automated, saving you all the trouble (and time) spent on mashing and boiling. Unlike traditional home brewing, you don’t need to monitor temperatures, add hops at specific times, or siphon and pump sticky liquid from mash tun to pot to fermenter. The Model C is an evolution of the Pico Pro, and the new design is even more consumer-friendly. The keg hoses are easier to connect, and just about everything that needs to be sanitized can be cleaned in the hot-water cycle of your dishwasher. By contrast, earlier PicoBrew machines—the Zymatic and Model S—rely on common industry kegging equipment that’s more robust and easier to find, but also more of a pain to use. Before I dive into my time with the Model C, let me share my brewing background. I’m by no means a master brewer, but I’ve been making beer for four years, and brew about once every two months. I started by using malt extract with steeping bags and a very basic kit, but now make 5-gallon, all-grain batches. I’m also on the more DIY side of the home-brewer spectrum. For example, my mash tun is a converted cooler. My own home-brewing equipment takes up a lot of space. 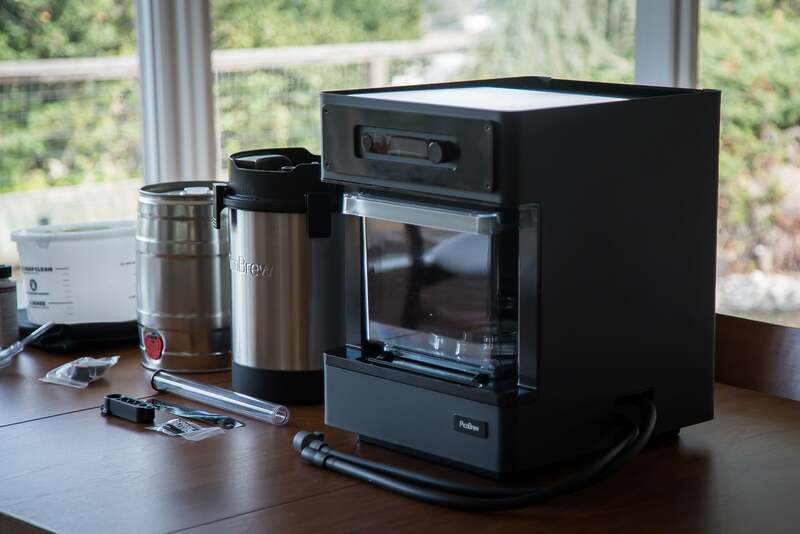 We’ve already covered the basic brewing process in our review of the PicoBrew Zymatic, and for an even more detailed look, I recommend the quintessential guide at howtobrew.com. Suffice it to say, home brewing takes a good amount of gear, time, and care. All your critical equipment needs to be cleaned and sanitized between brews. And there’s some precision involved—like adding your hops at the right boiling temperature, and checking alcohol content with a hydrometer. 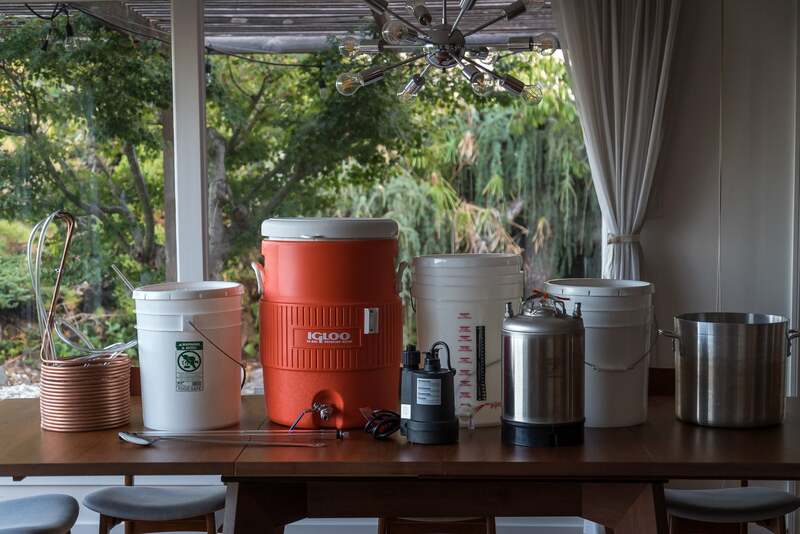 Like all hobbies, home brewing requires passion, and if the previous paragraph sounds more like faults than features, then that’s what the Pico Model C is trying to resolve. So let’s dive into the experience. 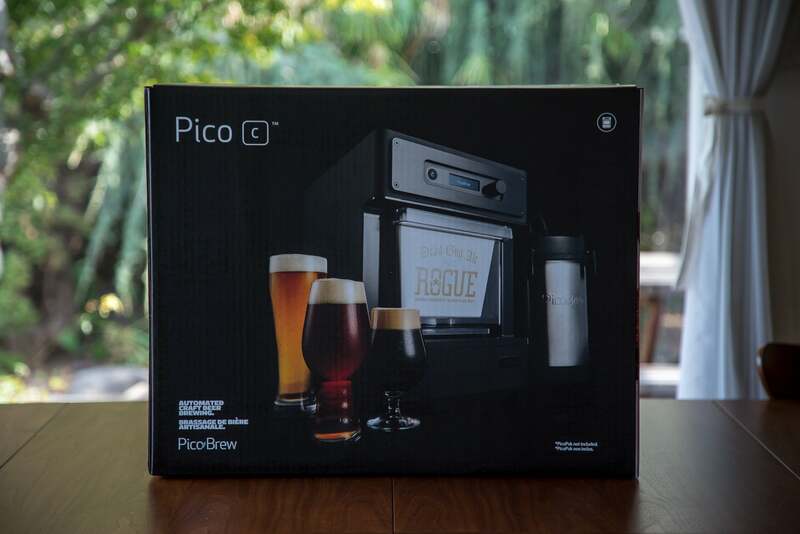 Right off the bat, I appreciated PicoBrew’s packaging: It’s nicely designed, and should provide some razzle-dazzle for anyone opening up the Model C as a gift. 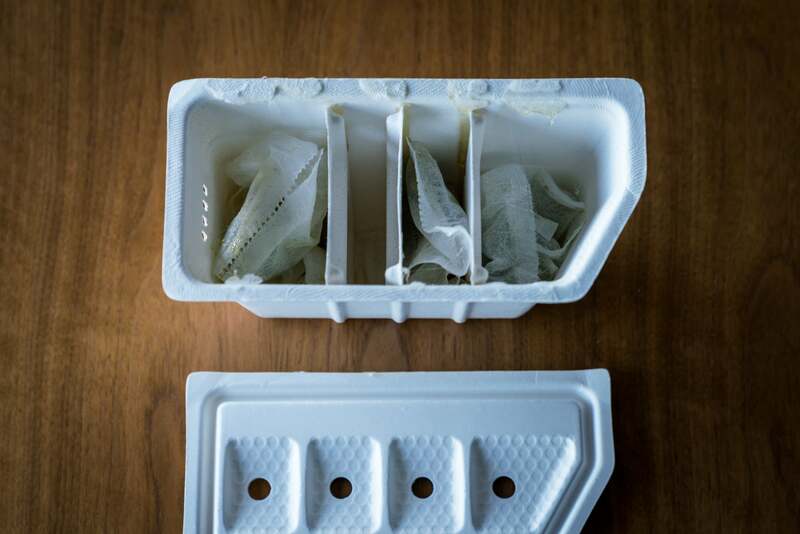 Everything necessary to immediately begin brewing is provided in the box, except for one thing: a paper manual. Instead, you just get a card pointing you to an online manual, which is clear and includes plenty of graphics. You’ll also find online instructional videos for the initial brewing process (PicoBrew says videos covering fermentation and other post-brewing stages will go live in late December and early 2018). When the Model C arrives, you'll be opening a lot of packaging—not just for the machine, but also the requisite kegs. The machine’s rudimentary LCD doesn’t impart much information, but it does issue short prompts during the brewing process. These messages should be sufficient to guide you along if you’ve already used the machine before. After taking everything out of the box and plugging in the Model C, you’re required to connect to Wi-Fi and log into your PicoBrew account. Brewing offline isn’t possible, as the machine needs internet access to determine which PicoPak recipe kit you’ve inserted, upload the right brewing instructions, and send the status of your brew in progress to a web portal. These are all great features, but the Wi-Fi requirement still makes be concerned about spotty Wi-Fi. The first time you use the Model C, you’ll need to do a “first rinse” to clean all your parts. This takes about 10 minutes and requires you to assemble the brew keg, partially fill the brew keg and reservoir with water, and connect the hoses. It’s an easy process thanks to some hardware changes PicoBrew made for the Model C.
Specifically, instead of using off-the-shelf, industry-standard parts, PicoBrew now provides custom-designed connectors that are easier to identify and attach. 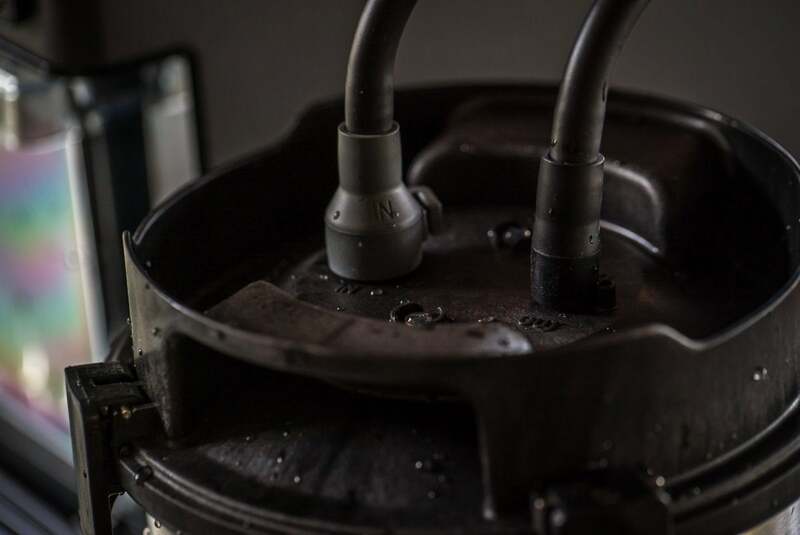 For example, the included hoses now have different connectors at the end, so they only fit onto their respective posts, and they simply slide on. And cleaning is easier, too: After fermenting, I was able to throw everything save the machine’s silicone gasket into the dishwasher. If you’ve ever spent time sanitizing hoses, kegs, and keg posts, you can imagine the convenience of dishwasher sanitization. Taking less than 10 minutes of total hands-on time, brewing with PicoPaks is incredibly easy. 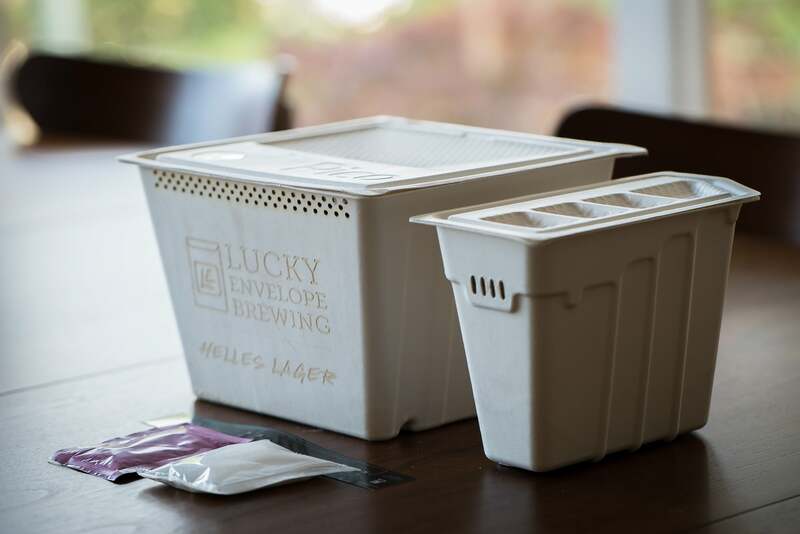 They’re essentially pre-packed, fully contained beer kits that include grain and hops packs, yeast, fermentation sugar, and a stick-on thermometer. 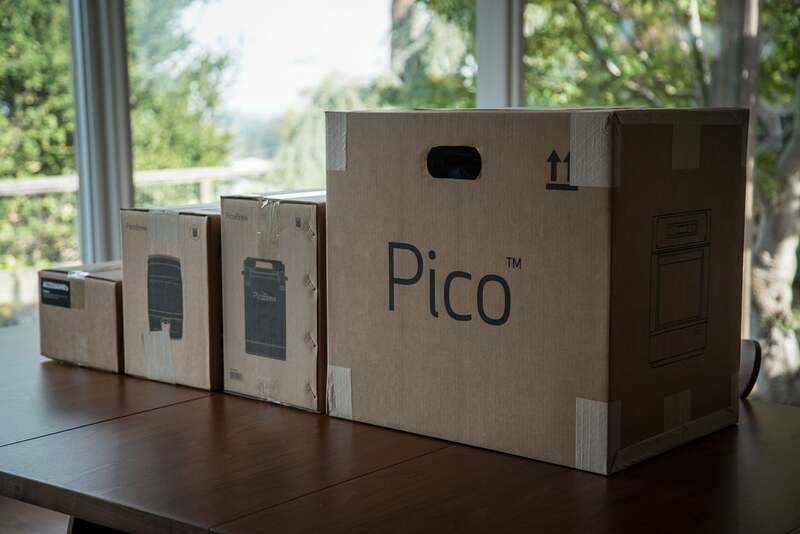 The PicoPaks seem a bit small to hold all the grain needed to make 5 liters of beer, but PicoBrew confirmed that most PicoPaks are all grain, except for the higher gravity beer recipes, which include additional dried malt extract. The grain and hop packs slip into the main filter bin. Then you fill an attached keg with water, push a couple of buttons, and the Model C begins brewing. You're not supposed to open the PicoPak bins, but I couldn't resist tearing into some extras to see what's inside. PicoBrew says it’s partnered with more than 200 breweries, and now offers more than 105 PicoPaks from those breweries, including recipes from Rogue, 21st Amendment, and Coronado. The PicoPak approach gives you access to obscure craft beers that may not be available in your area, and you also get to enjoy a level of freshness that might otherwise require a visit to the brewery. All that said, you can’t do much to tweak the beer created by a PicoPak. At most, you can change alcohol content and bitterness by about 5 percent through adjustments in brewing temperature and hop timings. For this review, I stuck with commercial recipes, but there is an option to order customized FreeStyle packs. You select a base style, then tweak the recipe by modifying the grain bill, and hop additions. Once you’ve created your recipe, PicoBrew will send you a custom, pre-filled PicoPak. Unfortunately, your FreeStyle options are currently a bit limited, with only three base malts and nine specialty grains. For example, I wanted to make a New England Style IPA, but flaked oats weren’t an option. The hops side of the equation is just as limited with only nine options, and the yeast they send you is determined strictly according to beer style. On the plus side, PicoBrew tells me more ingredients will be added soon, and ordering online is easy. The recipe builder also gives you some additional customization opportunities with three hop timings for bittering, flavor, and aroma. The brewing itself takes between two and three hours depending on the beer recipe, but it’s pretty much set it and forget it. However, if you’re at home, forgetting will be difficult as the machine is loud—definitely louder than a stand mixer, but not quite as bad as a blender. Because my kitchen opens up to the family room, watching TV was difficult. On the flip side, if I had been brewing conventionally with pots and a mash tun, I wouldn’t have even had time to watch TV. Instead, much of my time would be dedicated to temperature control, preventing boil-overs, and tossing in hops at specific timings. With the Model C, you can walk away and monitor the brewing online, viewing the current stage, temperature, and remaining time in a web interface. 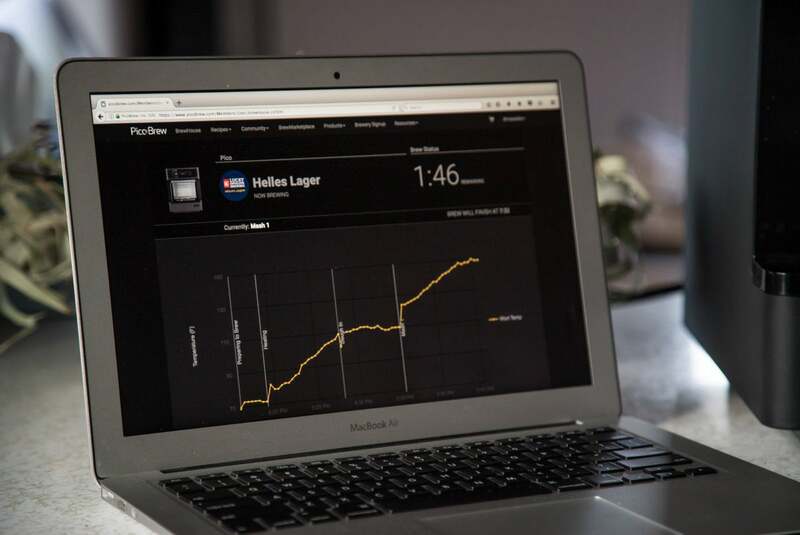 You can monitor the brewing process online. When the boiling stage finishes and the hot wort is complete, you attach a seal to the fermentation keg ports, and set aside the whole thing to cool overnight. As for cleaning, I appreciate that the hops and grain receptacles are made from an organic pulp, making it a breeze to just toss them into a compost bin. The day after brewing, your keg has cooled to room temperature, so it’s time to attach the sticker thermometer, and add yeast to the now-cooled wort. The thermometer will let you know how if you’re within a proper temperature range, and how long the fermentation will take. One my test batches was a lager that, according to the PicoBrew recipe, calls for a “fast fermentation” range of between 59 to 75 degrees. 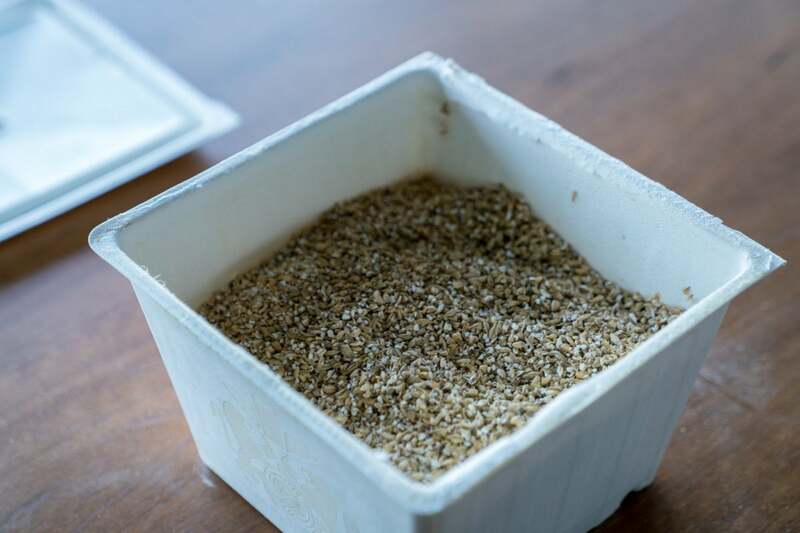 But according to Fermentis, the supplier of the provided yeast, the range of its Saflager 34-70 yeast is 48.2 to 71.6 degrees and optimally 53.6 to 59 degrees. When it comes to yeast, if the keg is too cold, the beer won’t ferment properly, and if it’s too hot, you might get off flavors. Now, I get that to make the process simple, they need to rely on room temperature (as most users will have no cooling or heating options), but still I had some doubts. I was able to keep the fermentation at around 65 degrees in my storage areas, and I didn’t really want to ferment off-temp, so I was never able to verify the efficacy of the back pressure device. PicoBrew also provided me with its new PicoFerm, a smart digital seal that monitors temperature and pressure during fermentation; I used it on another batch instead of the “dumb” silicone seal that comes standard. The PicoFerm will alert you if conditions get too hot or too cold, or if the keg has pressure issues. It will also let you know when fermentation is complete. The PicoFerm may give complete novices peace of mind, but I just don't see the point. Personally, I didn’t find it that useful, as the Model C kit comes with a sticker thermometer, and you should already have a general sense of the temperature range you’re fermenting in. What’s more, if you’re at work and a heat wave hits your home, there’s really nothing you’re going to be able to do at that point. Furthermore there’s very little risk in letting a beer ferment a bit longer than necessary. In fact, extra time would likely improve the beer. This as opposed to rushing it, and only waiting the minimum number of days. Perhaps if you wanted to compare batches—looking at how fermentation temperature and duration affect flavor—the PicoFerm would be useful. But I just don’t think Model C buyers are the type of people interested in that level of fine-tuning. Fermentation takes about one to two weeks depending on the temperature and the alcohol percentage (or ABV) of the beer you’re brewing. After that, the entire fermentation keg goes into the refrigerator for one to three days to cold-crash. During this time, the yeast and other byproducts settle and clump to the bottom. After cold-crashing, it’s time to rack the beer to the serving keg and let it carbonate. At this point, the Model C comes back into play to pressurize the keg and push your now-fermented (but flat) beer into the serving keg. 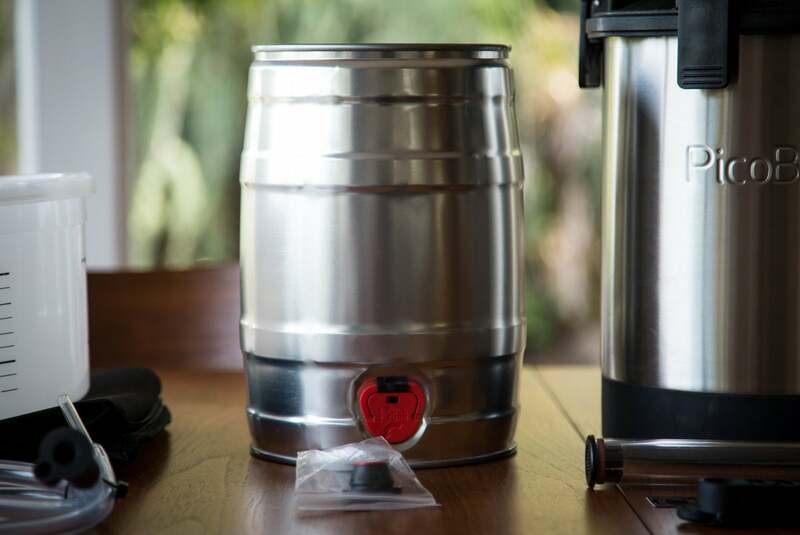 The kit comes with one 5-liter aluminum serving keg, and you can always buy more to have a stash of beers ready to drink. Once the serving keg is filled, you add the provided sugar and seal up the keg. This final dose of sugar reignites the fermentation process, creating carbonation. Once it’s done carbonating—which takes about twice as long as original fermentation—the beer is ready to drink. PicoBrew also sent me a force carbonating kit that uses small CO2 cartridges instead of sugar to carbonate. If you go this route, you can drink the beer in just a few days. Unlike the PicoFerm, I think the force-carbonating kit is worthwhile. Not only does it let you drink your beer much, much faster, it also keeps your beer from going flat—which is critical unless you can kill the keg relatively quickly. The Pico Model C makes beer brewing incredibly easy, controlling temperatures and timings, and using pre-filled ingredient packs. New designs also make the system more dishwasher friendly and foolproof.